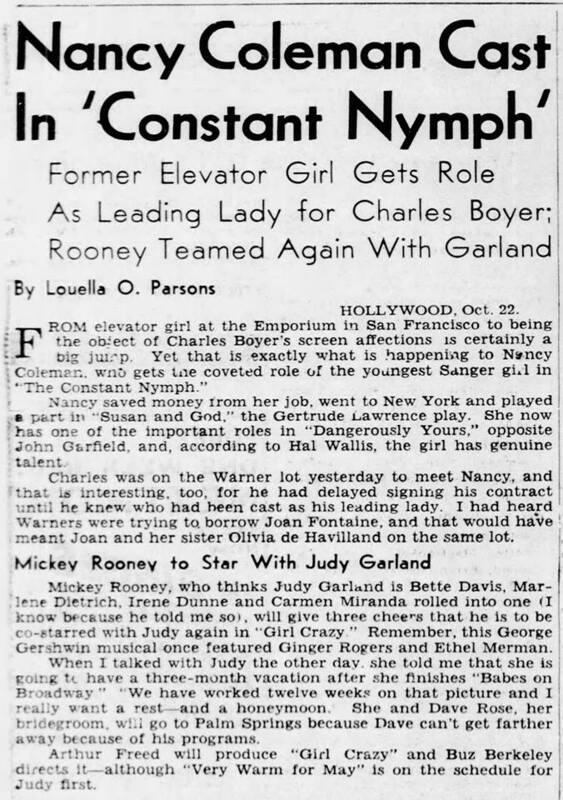 October 14, 1931: “Babie Marie Gumm” (Judy) performed at the Amercian Legion in Hollywood, California. October 14, 1933: “The Gumm Sisters” performed at the Casa Del Adobe in Lancaster, California. 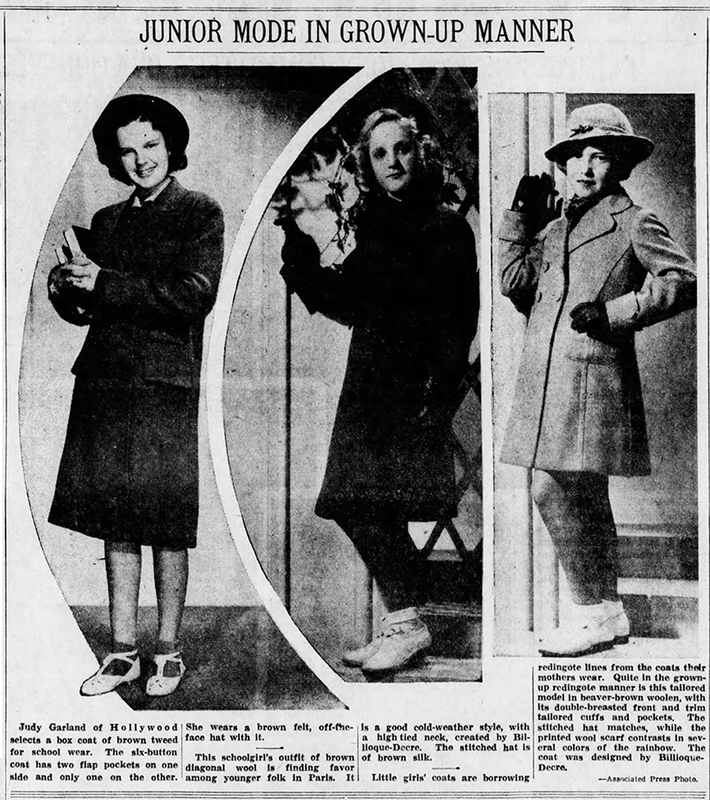 October 14, 1937: Judy wears the latest in teen fashion. 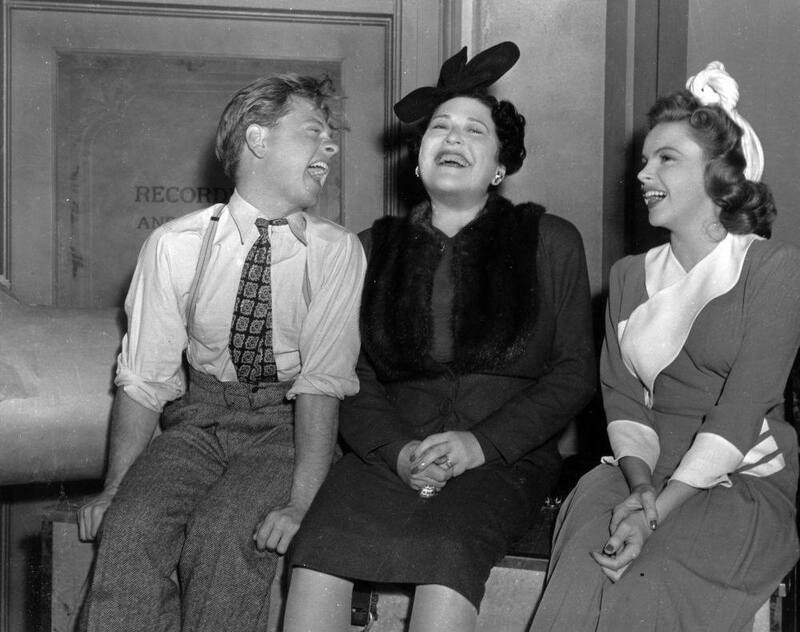 October 14, 1941: Louella Parsons visited MGM, including spending some time with Judy and Mickey Rooney on the Babes on Broadway set. Parsons mentioned her chat with the duo in her column, more than once, a few days later. Of course, Judy never got that “two-month vacation” that she allegedly told Parsons she would get after her work on the film. 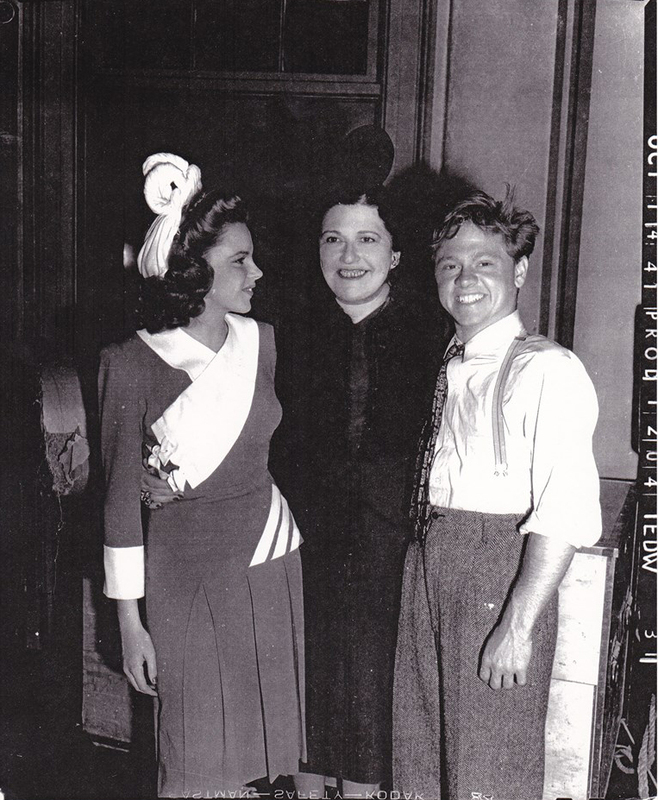 Judy was on the Babes on Broadway” set at 10 a.m.; lunch was 12:30-1:30 p.m.; dismissed 5:20 p.m. Scenes were shot on the “Interior Ghost Theatre” set. 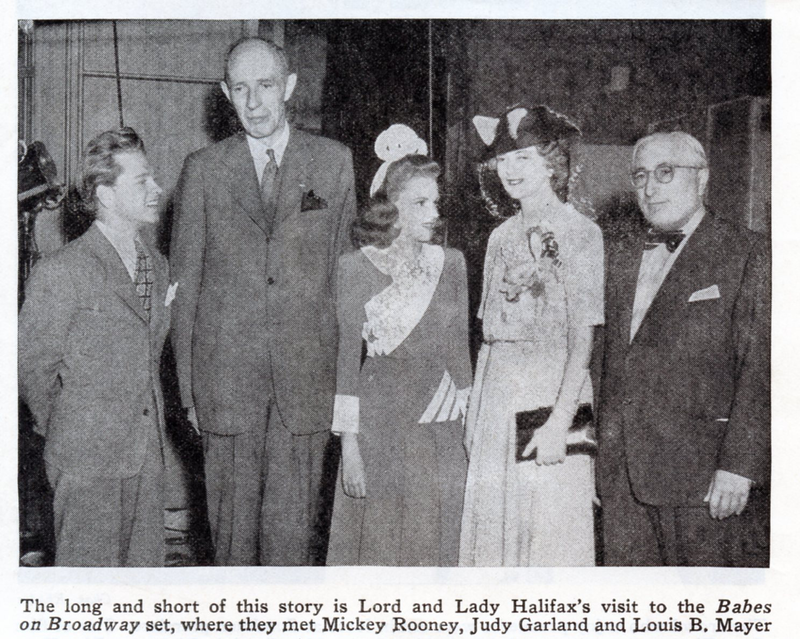 Lord and Lady Halifax also visited the set. Halifax was the English ambassador to the U.S. 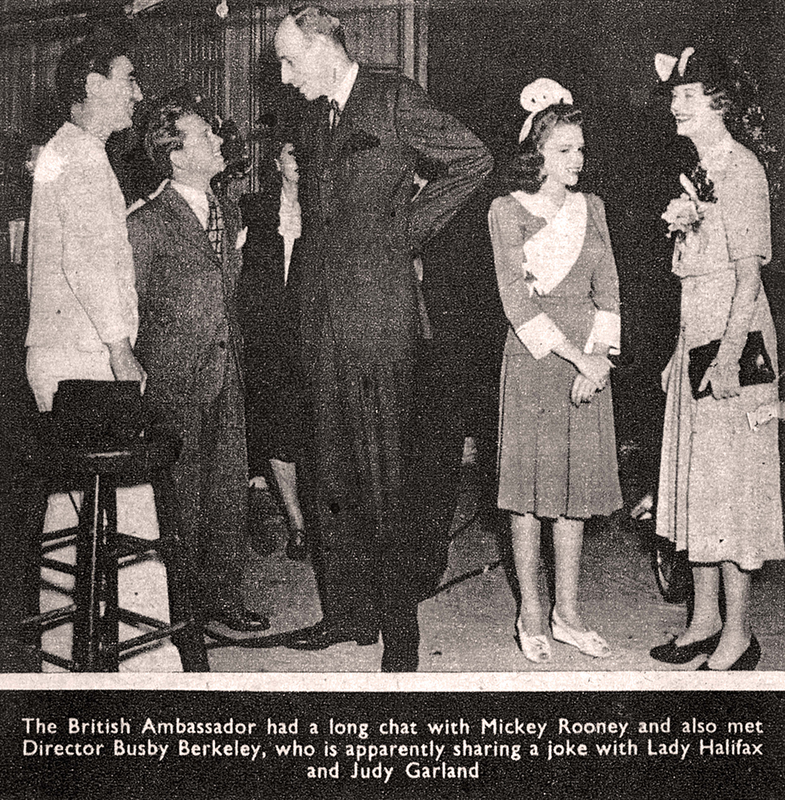 Photos were taken with director Berkeley as well as studio boss Louis B. Mayer. The exact date of this visit is unknown but it’s likely it took place on the same day as the Parsons visit. The production only had one more day to go before it was completed on October 15. Photos of Parsons visiting the set provided by Kim Lundgreen. Thanks, Kim! 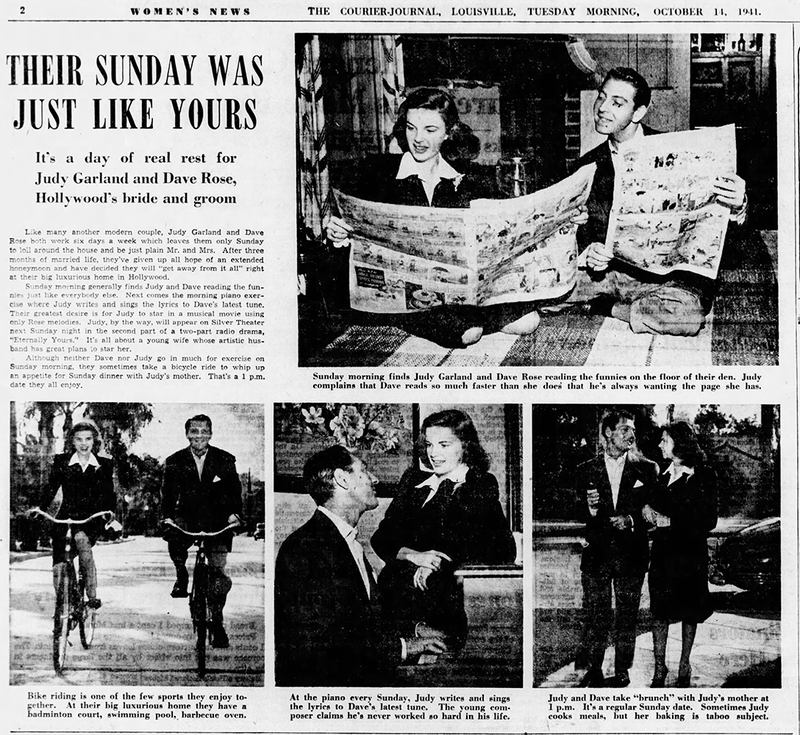 October 14, 1941: Here’s a newspaper feature showing Judy and husband David Rose enjoying their Sunday off just like normal people. 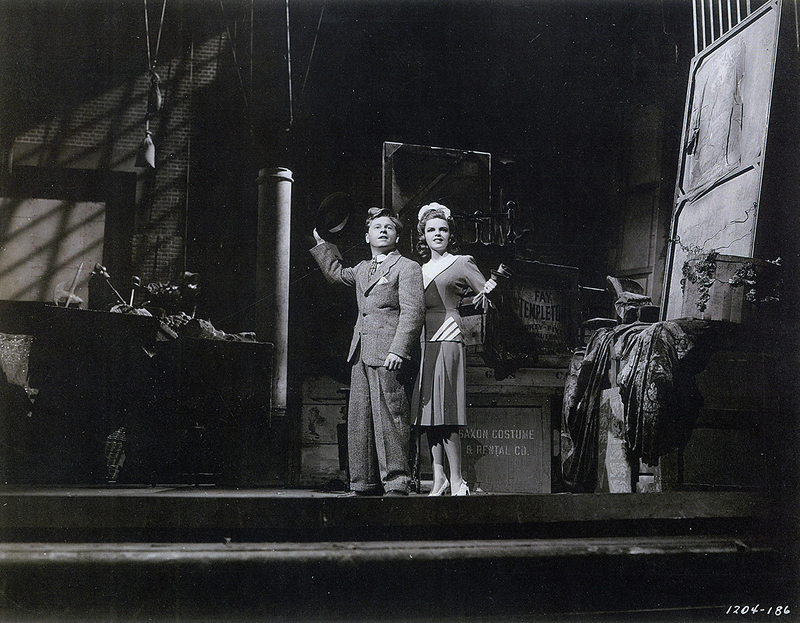 October 14, 1944: Filming on The Clock continued with scenes shot on the “Interior Subway Platform” set. Time called: 2 p.m.; dismissed: 5:40 p.m.
October 14, 1953: Photos from the third day of filming on A Star Is Born and the first day of location shooting. The production descended on Robert’s Drive-In at the corner of Sunset Boulevard and Cahuenga Street in Hollywood to films the carhop scenes. 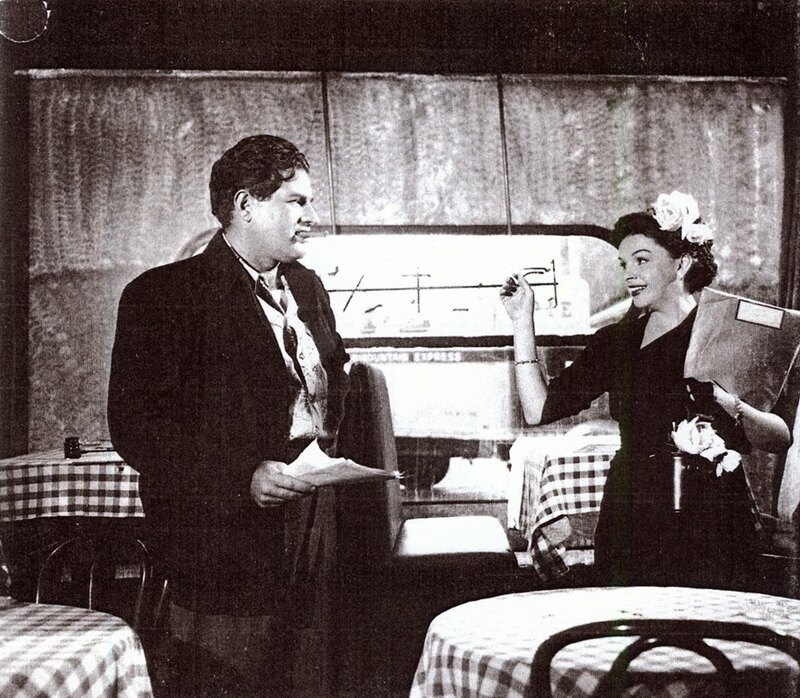 The scene was filmed in the morning, requiring eight takes for the set-up shots and fourteen takes of Judy – medium shot – telling the customer the types of hamburgers they had that day. The numerous takes were required due to the excessive background noises. Here is a wonderful comparison of the surviving footage of this scene from our buddy Mark Milano. Thanks, Mark! 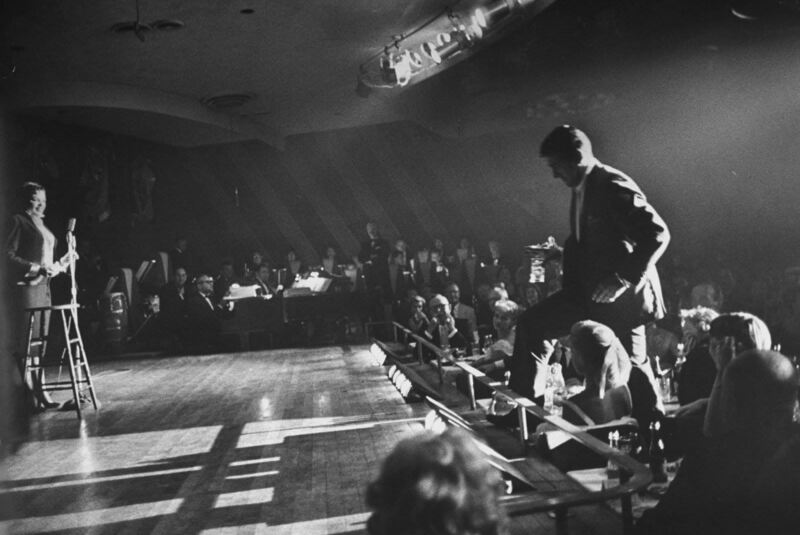 In the afternoon the production moved to 626 Spring Street in downtown Los Angeles, the Bomba Club, where they filmed sequences of Judy unsuccessfully trying to get a singing job. This sequence was cut before the film’s first release. The footage does not exist. 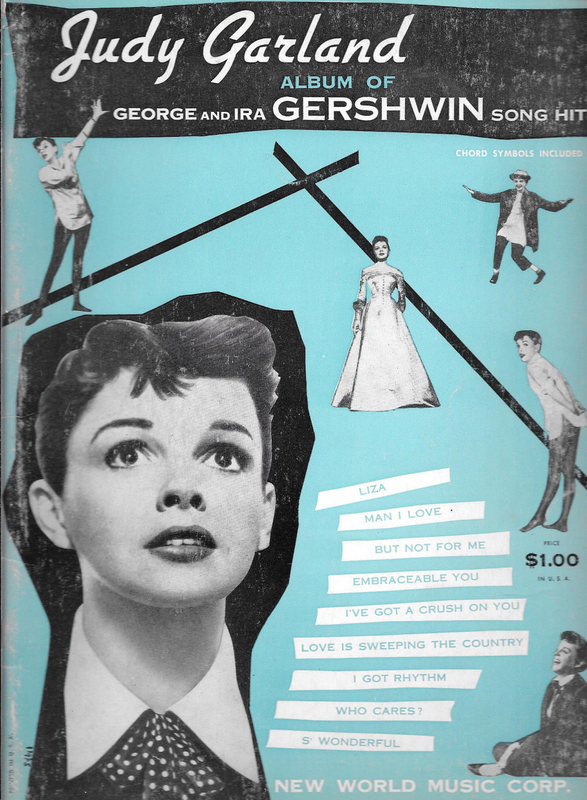 The company was dismissed for the day at 3:50 p.m.
October 14, 1954: A contract was drafted on this date, signed by Judy, agreeing to pay her $1,000 plus five cents royalty for each copy sold of The Judy Garland Songbook (published by New World Music and renamed The Judy Garland Album of George and Ira Gershwin Song Hits), for use of her photo on the cover. 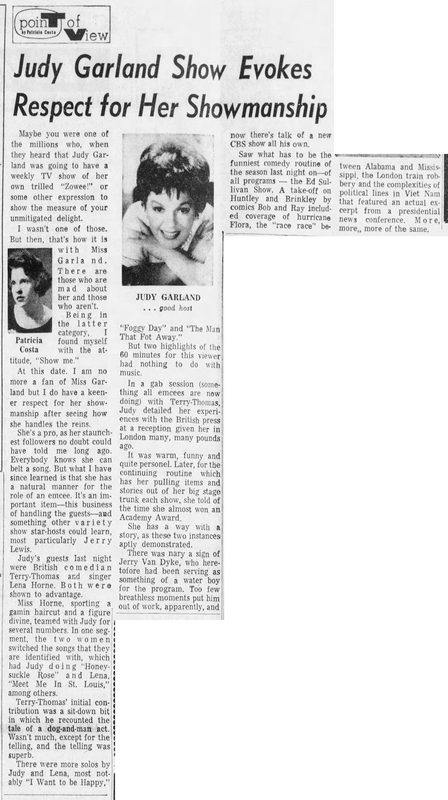 October 14, 1956: This article from the Sydney Morning Herald (Sydney, Australia), gave a brief explanation on how Judy was not on top (again). 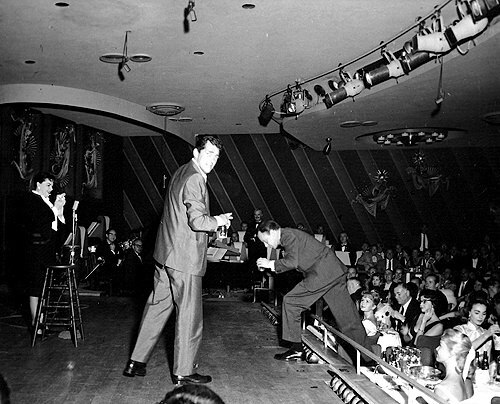 October 14, 1958: Judy’s final show at the Sands in Las Vegas. She had begun her run there on October 1st for a two-week engagement. 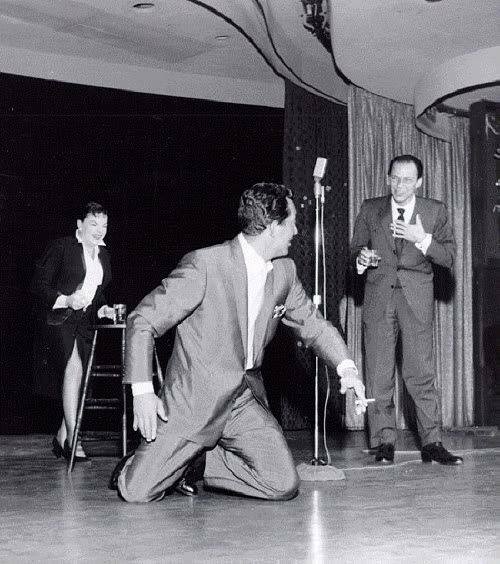 Judy’s friend Frank Sinatra chartered a bus to take a large group of Hollywood stars to see the show. 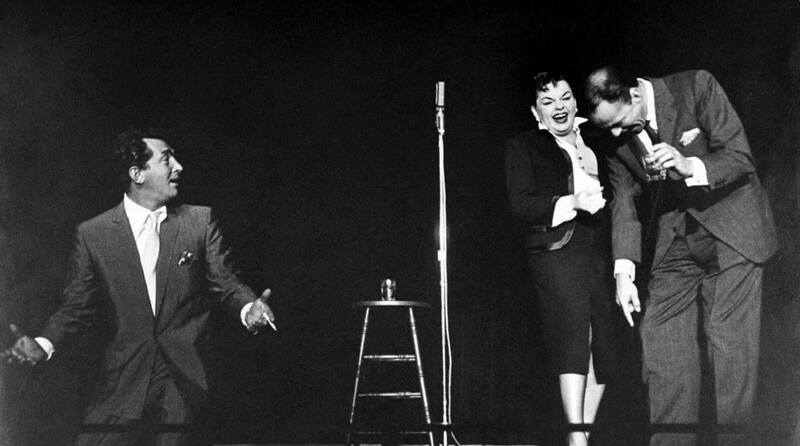 He and Dean Martin joined Judy on stage during part of this final performance. October 14, 1963: CBS decided they wanted to continue production of “The Judy Garland Show” for another thirteen episodes (for a total of twenty-six programs), to be followed by six reruns, although Judy’s contract with DBS gave her the call on whether or not to continue. CBS would not air any reruns though. 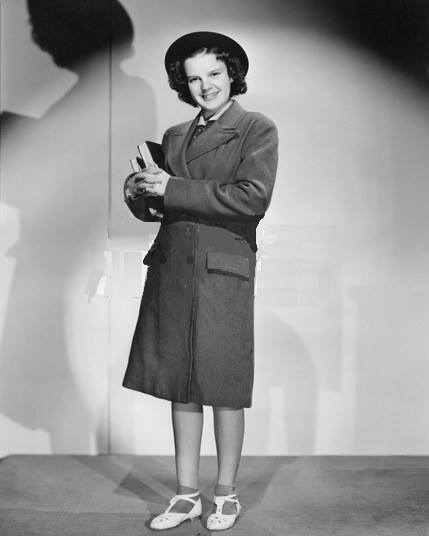 CBS decided they wanted to continued production of “The Judy Garland Show” for another thirteen episodes (for a total of twenty-six programs), to be followed by six reruns, although Judy’s contract with DBS gave her the call on whether or not to continue. CBS would not air any reruns though. 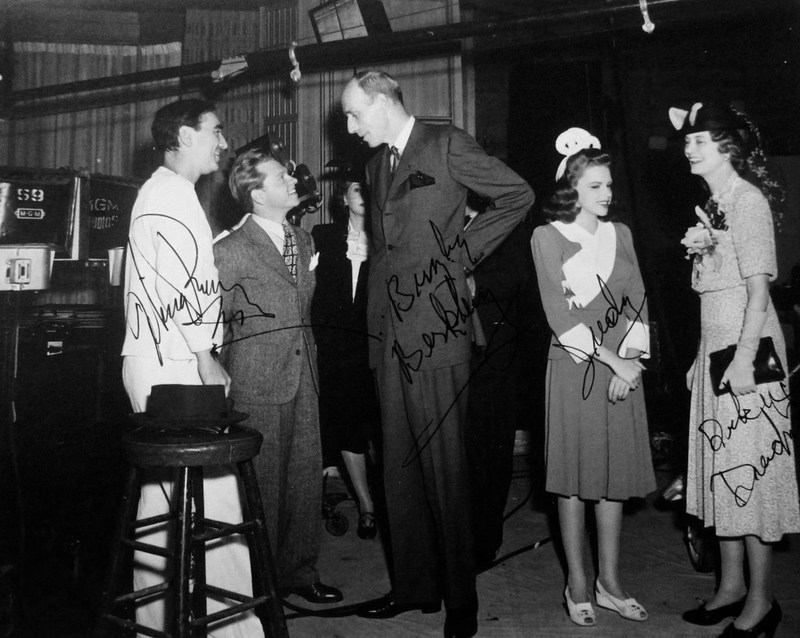 You wrote “continued,” but it should be continue without the past tense d.
If memory serves, Judy had five months ( a long time for her) off from MGM between the filming of “Babes on Broadway” and “For Me and My Gal”, which began production in Mach, 1942. (I believe there was a delay due Gene Kelly settling the closure of his Selznick contract). I believe I read Judy and David Rose got a way for a month or so at one point, but maybe I’m wrong. 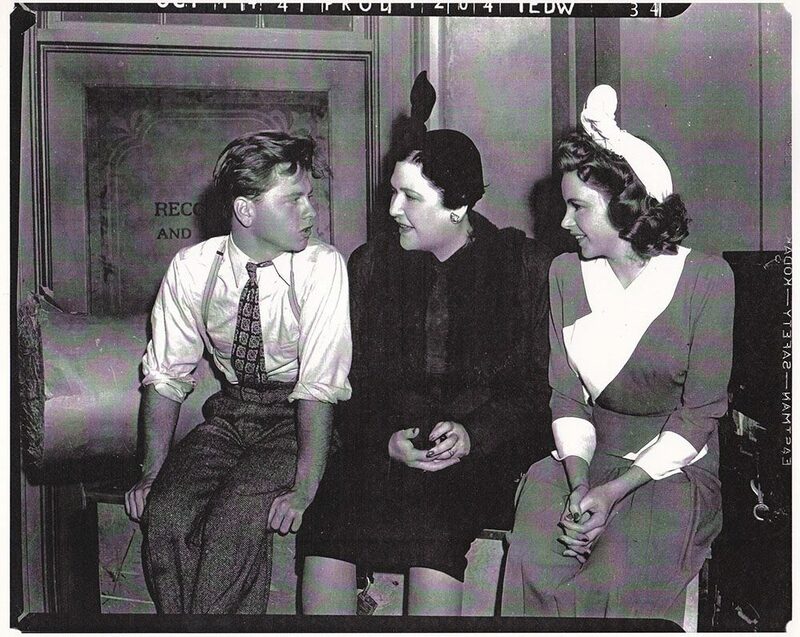 Those pics of Louella Parsons, Mickey and Judy are wonderful! Thanks.